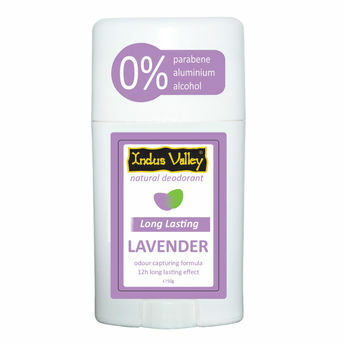 The Indus Valley Natural Lavender Deodorant has been made to give you a long-lasting impact for more than 12 hours a day. With natural ingredients as its main constituents and being free from harmful elements like aluminium, alcohol and parabens, this deodorant is mostly recommended by doctors. About the Brand: Indus Valley is a natural and herbal hair colour, pharmaceutical cosmetics and Ayurveda cosmetics manufacturer. The brand has an extensive range of pure essential oils, organic and halal-certified hair dyes, hair and skin care products that rejuvenate your mind, body and soul. Indus Valley products are free from toxic ingredients like ammonia, lead and are made in total natural surroundings. The company's factory is situated in Lower Himalayas in eco-friendly surrounding producing high-quality natural cosmetics. Explore the entire range of Deodorants/Roll-Ons available on Nykaa. Shop more Indus Valley products here.You can browse through the complete world of Indus Valley Deodorants/Roll-Ons .